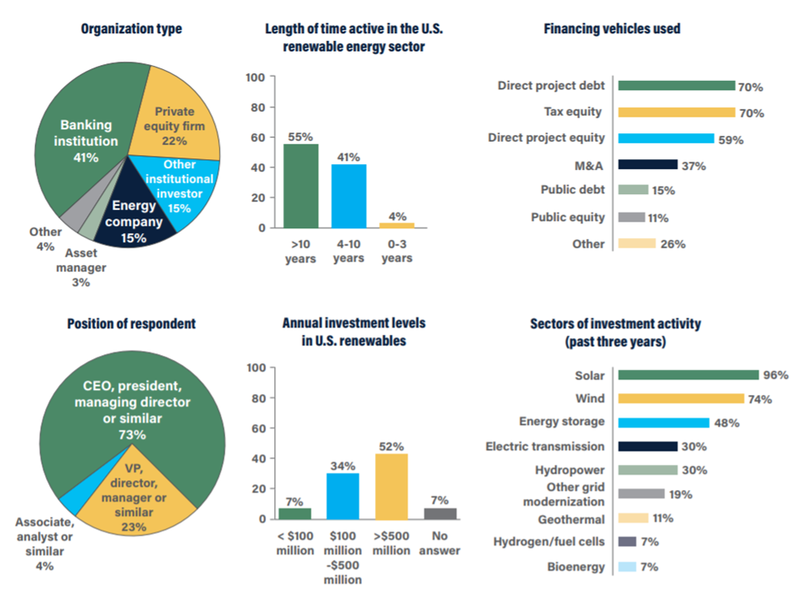 In April 2018, ACORE conducted a survey of prominent investors in the U.S. renewable energy sector to better understand the climate for investment amid ongoing national and global developments. Working closely with leading financial firms in our membership – banking institutions, asset managers, private equity firms and others – ACORE plays an important role in supporting capital formation and investment in renewable energy. This survey report supports our work by gauging investors’ confidence in the renewable energy sector, their insights about the impacts of market and policy changes, and their projections for cumulative private investment levels to 2030. 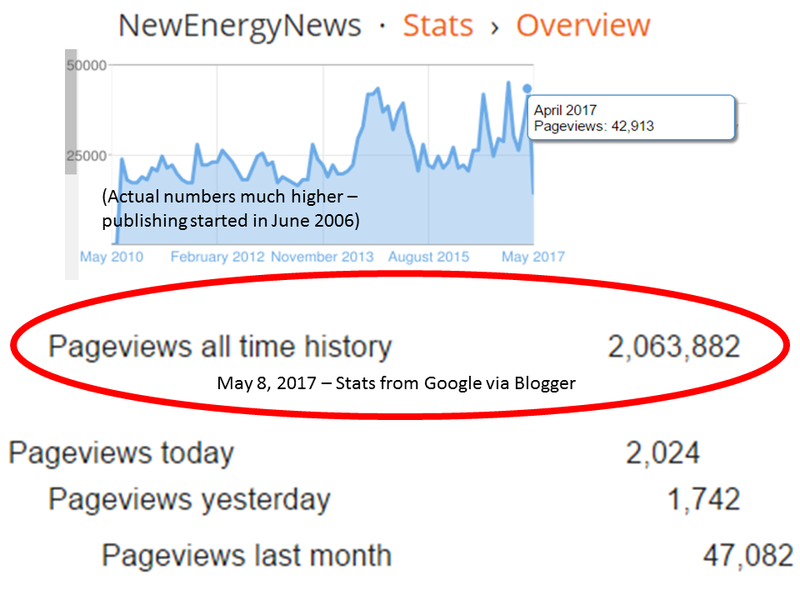 The results underscore a resilient and healthy market with significant potential for continuing, and even accelerating, the recent trend of dramatic renewable sector growth. Respondents expect renewable energy to continue to be an attractive asset class and anticipate that investors' confidence will remain high. While our aging grid infrastructure and mixed policy signals could limit future expansion, investors expect ongoing efforts to modernize the grid, coupled with policy signals that embrace a transitioning energy mix, to drive significant new demand for renewable energy over the next decade. 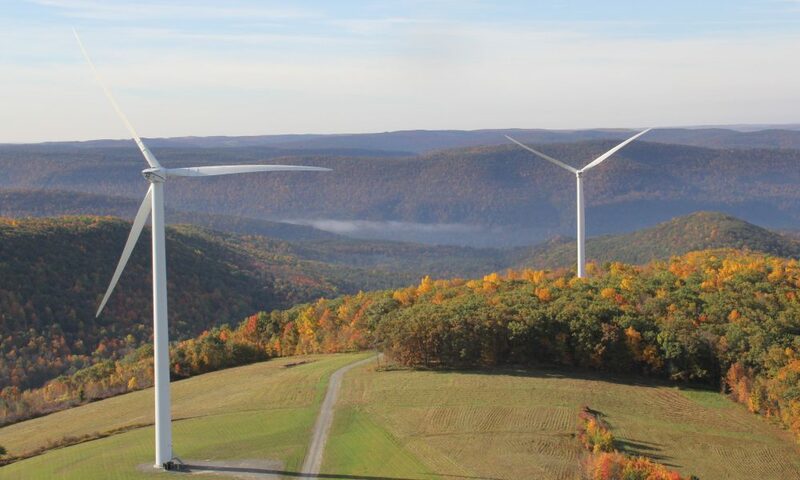 As part of this survey, we asked investors to project possible levels of cumulative private investment in the U.S. renewable energy sector and related grid modernization between 2018 and 2030 under an ideal market and policy scenario. 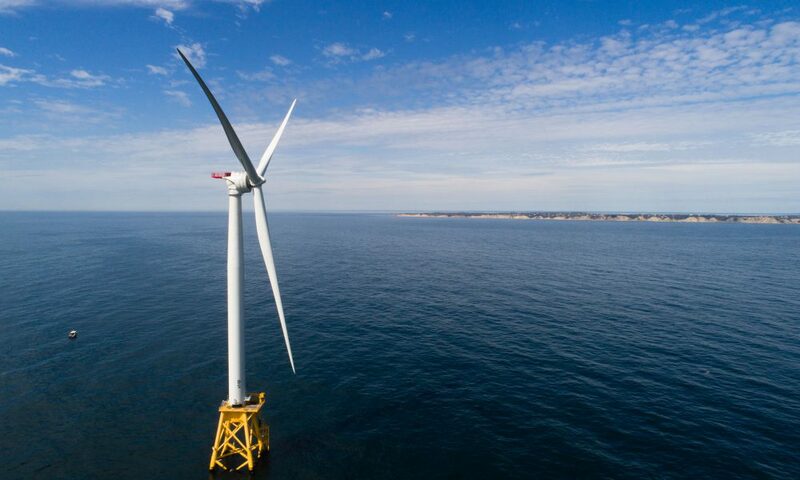 The responses indicate that the sector could attract $1 trillion by 2030, with investment split between renewable energy and enabling technologies that modernize the grid. With this report, ACORE is launching a campaign to help make this $1 trillion by 2030 projection real. 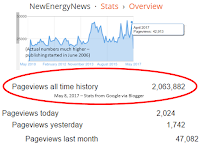 We will be strategically advocating for the market and policy reforms necessary to realize this growth in renewable energy and grid investment over the next decade. • Policies to Stimulate Growth: While existing tax credits for renewables remain on schedule to phase out after 2021, federal policy signals will remain important for supporting long-term investor confidence, as they are for other industries. 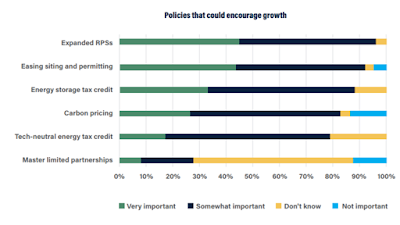 In particular, respondents identified carbon pricing and a technology neutral energy tax credit as potentially important. Respondents also expect states to play a particularly significant role in stimulating demand through ambitious renewable portfolio standards. They also identified reforms to siting and permitting processes as key for substantially increasing renewables sector growth. • Market Demand Signals: Market developments such as increased corporate purchasing and growth of the storage and electric vehicle sectors are expected to create new opportunities for renewable energy growth. However, challenges remain. Respondents highlighted the need for market-based signals that better reflect the values and services provided by energy storage and renewables to prevent our aging grid from hindering growth. Respondents reported that, with sustained demand, U.S. renewable energy will continue to be an attractive asset class with strong potential for investment growth. • Over the next three years, investor confidence in the U.S. renewable energy sector is expected to remain high, with an average confidence level of 84/100. 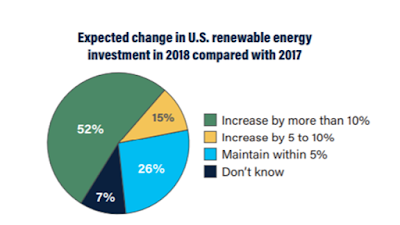 • Two-thirds of respondents plan to increase their investments in U.S. renewables by more than 5% in 2018 compared with 2017, and half plan to increase their investments by more than 10%. None reported plans to decrease renewable investment by 5% or more. • Respondents also expect renewable energy to increase in attractiveness compared with other asset classes in their investment portfolios over the next three years. • Company projections to 2030: A large majority (89%) of respondents who chose to project their companies’ investments in U.S. renewable energy between 2018 and 2030, said they would, at a minimum, double their planned investments in U.S. renewables under an ideal policy and market scenario compared with a business-asusual base case. 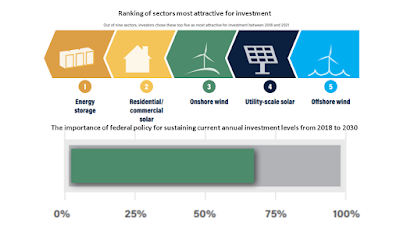 • Total sector projections to 2030: When considering ideal policy and market scenarios, 70% of respondents indicated that cumulative private investment in U.S. renewable energy could reach $500 billion between 2018-2030, while 26% projected it could reach $1 trillion. In addition, investors projected similar investment levels in energy storage and related grid enhancements over that same period. Market and policy changes over the coming decade will drive new demand for renewable energy, but investors are cautious about potential mixed policy signals to slow demand. • More than half (58%) of respondents identified the lack of a federal policy driver for renewable energy after the sunsets of the production tax credit (PTC) and investment tax credit (ITC) as a hurdle for continued growth at current levels. 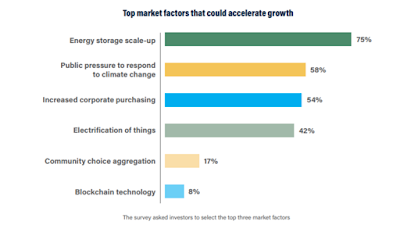 • A majority (88%) of the respondents identified energy storage to be a leading magnet for investment within the next three years. 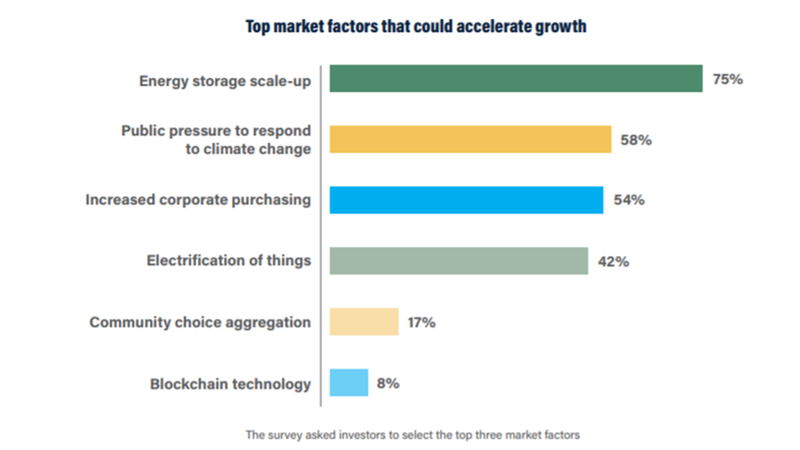 This investment should, in turn, stimulate renewable energy development, with three-quarters of respondents reporting energy storage scale-up to be an important market driver for renewables growth to 2030. • More than half (59%) of tax equity providers represented in this survey do not plan to reduce their planned tax equity investments over the next three years in response to the new Base Erosion and Anti-Abuse Tax (BEAT), which was enacted with the 2017 tax reform package. Thirty percent of respondents reported that the effects of the law are still unknown. 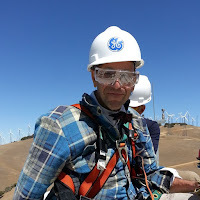 Sixty-seven percent of the surveyed companies plan to increase their investments in U.S. renewables in 2018 compared with 2017 by more than 5%, citing “increases in volume in new and secondary business” and “more opportunities.” No respondents reported that they would decrease their companies’ investments by more than 5%. The BEAT, which passed with the 2017 tax package, imposes a new tax on qualifying multinational corporations that invest in tax equity. While its full impact on the sector is still unknown, the majority (59%) of tax equity providers represented in this survey reported they do not plan to reduce their planned levels of tax equity investment in renewable energy projects to 2021. The Role of Policy Federal and state policy will continue to play an important role in sustaining renewable investment and growth to 2030. 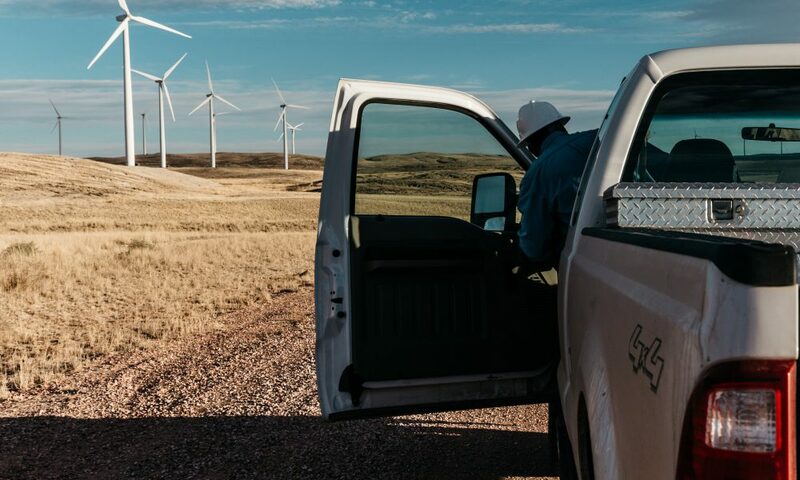 Fifty-eight percent identified the lack of a federal policy driver for renewable energy after the sunsets of the PTC and ITC to be a hurdle for renewables growth. 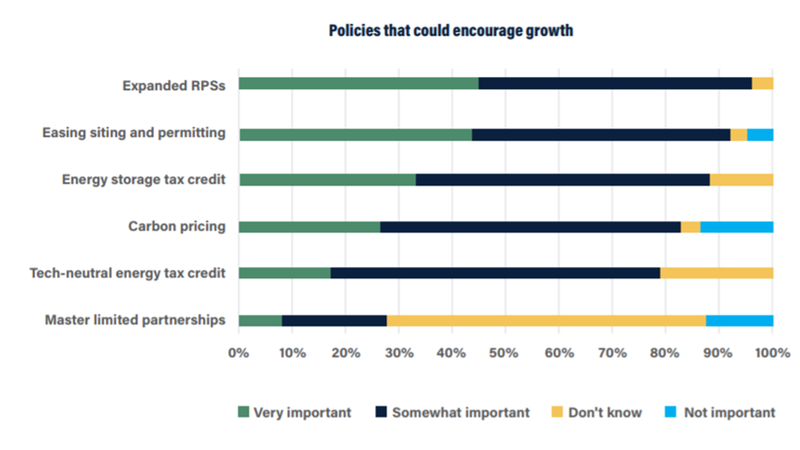 Respondents identified carbon pricing, a technology-neutral energy tax credit and/or a federal tax credit for energy storage as important potential federal policies that could help stimulate demand over the coming decade. 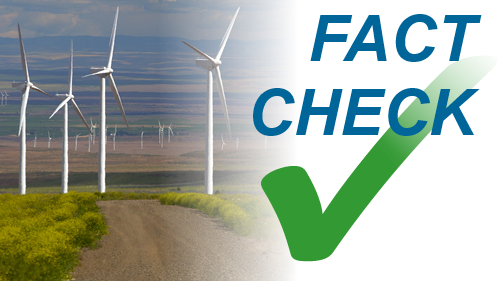 State renewable portfolio standards and eased siting and permitting processes topped the list of most important policies to encourage market expansion. 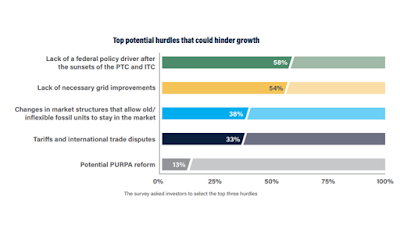 Potential Hurdles <> Respondents also identified potential new policies and regulatory changes that could hinder growth, including changes to market structures that would allow old/inflexible units to stay online, as well as tariffs for renewable energy components that could incite international trade disputes. Market factors will create new opportunities for renewable energy growth, notably energy storage scale-up, public pressure to respond to climate change and increased corporate purchasing. Nonetheless, there will continue to be challenges. Lack of necessary grid improvements was identified by 54% to be a barrier to future renewable energy growth. Write-in answers also identified low natural gas prices, low electricity load growth and interest rate risks. A majority (89%) of responding investors said they would double their companies’ cumulative investments over the period 2018-2030. 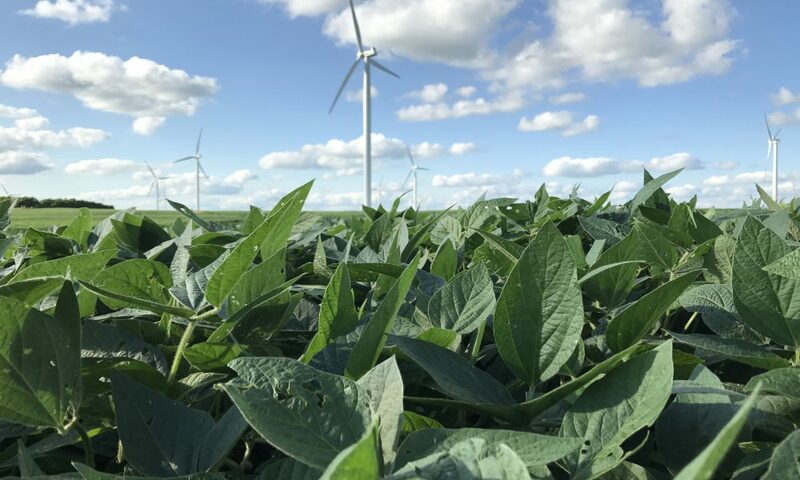 Seventy percent of respondents projected that cumulative private investment in U.S. renewable energy would reach $500 billion over the period between 2018 and 2030, while 26% projected it would reach $1 trillion. Respondents projected that additional investment in energy storage, transmission and advanced grid technologies, to help improve integration of renewables and support market growth, would also fall within the range of $500 billion to $1 trillion over this same period.